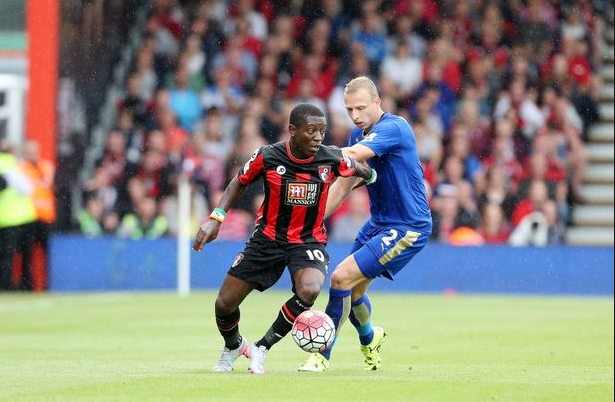 Bournemouth: So Far So Good, But Room For Improvement? Very much like Watford, Bournemouth are executing the perfect 1st season in the Premier League. Pre-season they were listed as 6/4 odds to get relegated yet they’re comfortably above the relegation scrap. Their season has included a memorable victories against Chelsea and Manchester United but severe knee injuries limited their attacking stable and they have still scraped together 41 points as a debut PL side, which is actually pretty impressive all things considered. It was interesting to see how much pragmatism Bournemouth would have to adopt as they got adjusted to a higher level of competition, seeing as they came with the reputation of having been one of the most attractive Championship sides in years. It’s kind of a shame that we were robbed of a full season of Max Gradel and Callum Wilson together. Gradel was one of the five best players in Ligue 1 last season, almost a one man offense for Saint Etienne as a half space winger. His speed is terrifying and you could’ve easily seen his type of play translate well into the Premier League. Against West Ham, the duo were impressive and even though all of the four goals for Bournemouth involved shocking defending you could imagine what a full season with those two would’ve added to their club, especially given how most teams in the PL can be susceptible to counter attacking football. You’ll notice a trend here going forward, because a decent amount Bournemouth’s issues can be described by a broad talent deficiency at this level. This isn’t any shock, seeing as the jump from the Championship to the Premier League has proven too much for many promoted teams. A lot of their build up play does lead up to throughball opportunities which is a good profile to follow, but understandably the back-ups to Wilson or Gradel aren’t of the same quality. This could be seen with their shot profile. 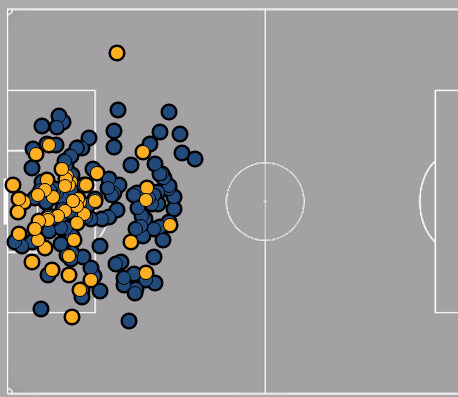 Despite some focus on the creation of high quality shots, more than 50% of Bournemouth’s shots this season have come from outside the area This is how it looks for their shots on target. Southampton were and to some extent still are renowned for being another team dedicated to attacking football. 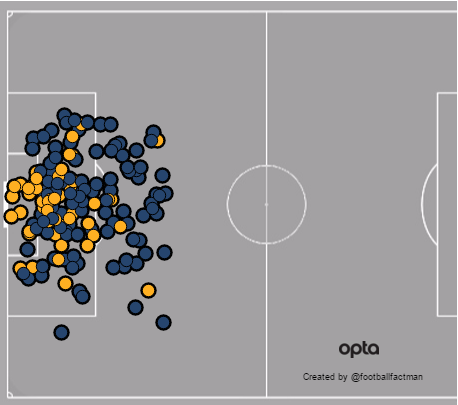 Bournemouth’s shot chart was somewhat similar to Southampton’s during their one full season with Mauricio Pochettino as their manager. You could argue that alongside Southampton, Swansea were another predecessor to Bournemouth: a possession based side who also liked to think of themselves as an example of how to play football the right way. This is how both of them compared to Bournemouth in their first years in the Opta Era. There’s two paths that Bournemouth can take as a club. Swansea have been somewhere between average and below average over the past 5 seasons and variance until this season had kept them 8th-12th. Meanwhile until Leicester gathered up all the fairy dust known to man, Southampton had become the new model club that’s kept pushing the boundaries on how far they could contend and seemed genuine 4th place contenders, if only things fell right. 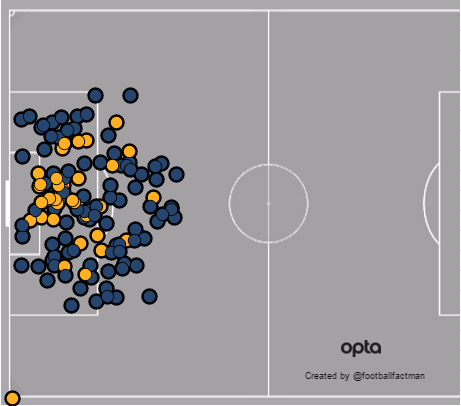 We could even see the progression offensively from Southampton with multiple seasons of aggregating talent and solidifying their foothold as a stable Premier League club allowing them to become better in their shot selection while still having the volume from previous years. Eddie Howe has garnered loads of attention for his work both last season and this. With Everton’s struggles this season and an overall cooling down on Roberto Martinez, people are trying to put two and two together by suggesting that he could be Martinez replacement. I’d like to see what Howe does with more experience at Bournemouth before making the leap to a bigger club and find out how season two in the league pans out. It wasn’t too long ago that Martinez was hailed as a real up and coming manager himself but the league can be unforgiving. In comparison to Martinez at the same age, it could be argued that Howe’s version of utopian football has more of a chance of actually succeeding. One intriguing thing with Bournemouth is what they’re doing on set pieces. The next frontier to exploit in football may well be set pieces, with Atletico Madrid being the gold standard. Bournemouth are behind that level but there are signs that they’re possibly looking into this more than the average club. They’re 6th in set piece shot ratio and they’ve unveiled some trickery here and there. The end results haven’t actually been that good, their goal% in these situations is 6th worst at 41.7%. But the fact that they’re cognisant of the potential benefits is positive. Clubs of Bournemouth’s size have to take advantage of these types of inefficiencies. Bolton with Sam Allardyce did it to the extreme a generation ago and they were a huge success. I wouldn’t expect Bournemouth to go to nearly the same degree as Big Sam did because football has evolved but a few extra goals here and there from exploiting obvious inefficiencies is a smart focus. Most of the time when a team have a low save percentage, the first instinct is to say that it’s unlucky. There’s been research done during the very beginnings of the analytics movement in football that showed save percentage year by year is close to unrepeatable. If people looked at Liverpool’s rate, they’d say that they’ve been pretty unlucky this season. Naturally similar things would be said about Bournemouth when one takes into account that theirs is actually considerably worse. Bournemouth have the worst shot quality per shot on target conceded in the Premier League this season, just barely worse than Norwich. That’s right, even Aston Villa aren’t conceding such easy opportunities. This has been even more pertinent in games against tougher competition. Spurs and Man City have scored 17 goals in their four matches against them, Arsenal created six Big Chances in their first meeting in December, hell they let West Ham score six goals combined in their two fixtures. It’s been obvious that as soon as Bournemouth play someone that’s anywhere close to the level of the established elite, they leak goals. So if we’ve just spent nearly 1000 words on the weaknesses of Bournemouth, why are they so interesting? Well it comes down to the old adage of “process over results”. Some results have been bad and although gaining points at the hand of rivals has proven successful, if it wasn’t for the complete incompetence of Villa/Newcastle/Norwich/Sunderland, Bournemouth would probably be much closer to relegation than they currently are. But the actual process behind all of this is surprisingly sound. There has been tactical analysis done on Bournemouth previously, both on the ball and off it. It looks like there’s a relatively deep complexity to how everything is done, even hinting at the now famed Positional play. Obviously we’ve watched more of the deficiencies than we have their strengths and those articles both warned that there would be growing pains but it is encouraging that behind all of the carnage displayed is discernible method. That being said, it’s easy to say that just upgrading the talent will solve these problems but getting the talent in of itself is an arduous task. One of the problems that Bournemouth face is just how rigid the Premier League can be for a club like them. Leicester are a freak and shouldn’t seen as some way to climb up the table. Building for the long term is in their best interest, but thinking of it as a linear progression would be sugar coating it because despite the TV money making it more easier for smaller clubs to keep their own players, it’s still hard to convince them that Bournemouth aren’t a stepping stone club unless they make the leap like Southampton did. This isn’t to entirely demean what Bournemouth currently have because they do have some quality players, including Junior Stanislas. If they ran it back next season with more or less the same roster but have Gradel/Wilson healthy, they should have enough to finish 14th-15th again, with a view to progress down the line. As a team battling against the odds, smart recruitment is an area in which they may be able to secure an edge and should be exploited. Bournemouth are in the early days of their PL expedition and they’ve already accomplished step one of a multistep plan, which was to avoid relegation and keep collecting the TV money that will become even more valuable with the new deal kicking in next season. Some of their peripheral numbers seem pretty decent despite the mass amount of injuries in addition to it being their first season in the top division. The actual quality of football hasn’t been as awe inspiring as it was last year because of a jump in competition, but there’s a framework for something grander. Talent more or less wins out and Bournemouth may have a tough time retaining their better players and attracting more, but if they can do that there is the blueprint for perhaps the next Southampton to emerge.